A book by IIM Indore’s Research Scholar Avik Sinha namely, “Capital Market Returns, Utility Price, and Exchange Rate Movements: Evidences from India after Credit Crisis in 2008” has been published by Scholars’ Press, Germany. 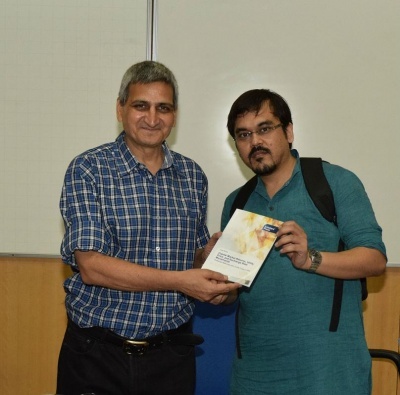 The book launch ceremony took place at IIM Indore on September 14, 2015 by Mr. Kalpesh Yagnik, Group Editor, Dainik Bhaskar during an Invited Talk. This book talks about how the volatility in the utility prices in Indian market has been changing after the credit crisis in 2008. This is an academic non-fiction book, which discusses about the year 2008, when the world was hit by credit crisis, and India saw the emergence of energy trading. This book would prove to be of great benefit to researchers and academicians in the field of Finance and Economics, as well as to the practitioners in the field of capital market.